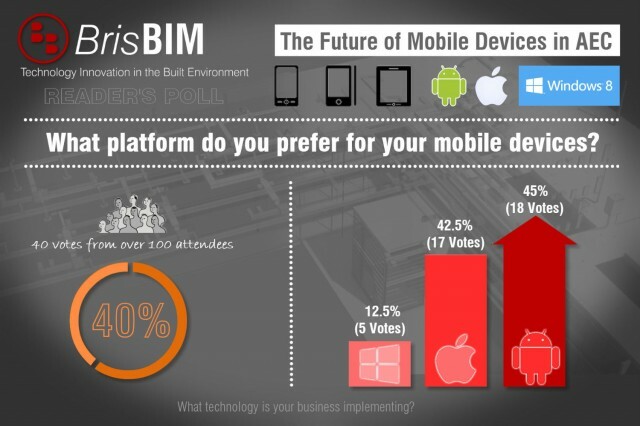 These statistics are reinforced by the fact that Autodesk recently announced that FormIT is coming to the Android platform. I’m still unsure of the best direction for businesses to head though. At another recent Autodesk event aimed at construction, looking at tools such as BIM 360 Glue and BIM 360 Field, Autodesk suggested that they had no plans to release these apps for the Android platform and instead were considering porting them to Windows 8. Their reasoning is that many larger companies are completely avoiding Android with IT departments worried about controlling security vulnerabilities within a corporate environment. Alternatively Windows 8 appears to be a much better fit for business. This still leaves us with the fact that iOS is the first platform supported, but some Windows based companies remain very anti-Apple. Obviously if Apple is compatible with your IT environment, it is an easier choice. I can understand why Autodesk is releasing some conceptual design apps such as FormIT on Android, because they are used in very early stages of a project, where as other apps such as BIM 360 Glue and BIM 360 Field are used much later in a project by large teams. Their use isn’t as casual. Perhaps this changes your perspective on device selection? Of course this is just my interpretation of unconfirmed information, but it certainly is food for thought. betterRevit, bringing you better statistics! 3 Responses to Which Platform is best for Mobile Devices in Construction? late to comment here, but with the introduction of Knox, android is arguably the most secure mobile enterprise platform. android syncs better for me on windows desktop, tablet and phone are android. Apple customer service never focused on problem solutions, just wanted to replace and charge for it. Will never purchase apple products again. I would really like to see BIM 360 field available on the Microsoft Surface Pro, as our company’s computer operating system is Windows, and if would be great to keep it consistent. Instead, most of our employees have iPads and HP laptops.